It’s December, work slows down, the big summer break looms, you have the energy and the time to do more yoga and then…your yoga center closes down for the summer! Don’t despair; it is a good time to start your own practice. We attend classes to be inspired but ultimately yoga comes down to your decision to find time for your own practice. When you are relaxed and free over the summer break it is a perfect time. It is only when we find our own personal practice does yoga truly become a part of our lives and in becoming so transforms us. It is important to attend classes to continue to progress, learn and stay inspired. Finding time – Keep your practice short 10-15 minutes. I advise students to start with 4 poses only. If your enthusiasm extends your efforts, great! ‘I don’t know what to practice!’ – I come back to the 4 poses; keep it simple and short. Headstand and shoulderstand can be added to each sequence. Headstand is generally practiced after standing poses and counterposed with shoulderstand or any of its modifications. You could also add one pose that you have found particularly challenging. Put aside 3-5 minutes for relaxation at the end of each sequence. ‘I don’t know if I am doing the poses correctly’ – You can occasionally use a mirror. If you are unsure ask your teacher to check your alignment in the class and try to remember how it feels to be in that position when you come to your own practice. ‘It’s hard to stay motivated alone’ – Find a yoga buddy and check in with each other every week to see how many times you have managed to practice. 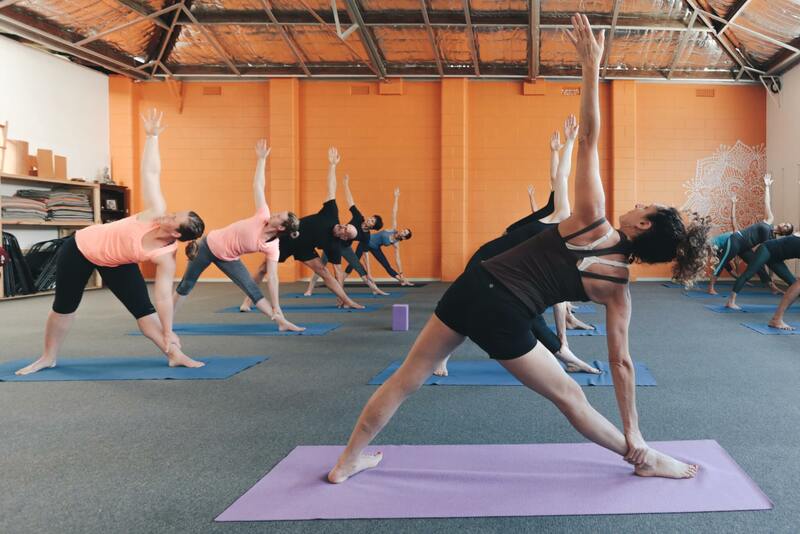 ‘I don’t have the space to practice’ – You only need the size of your mat. Some wall space can be useful. You can find this anywhere including when you travel. I don’t have the equipment – It is worth investing in a decent mat, 2 blocks, a belt and a bolster. You can probably find blankets at home. Standing poses: Practice each pose 2x to each side for around 5 breaths each repetition. Triangle pose lengthens the hamstrings, and inner thigh muscles and strengthens the spine. Stand with the feet a leg length apart, turn the right foot out 90 degrees and the left foot in 10 degrees. Reach out over the right leg to take hold of the right shin or ankle. Brings flexibility to the hips and strengthens the quadriceps and spine. Turn the right foot out 90 degrees and the left foot in 15 degrees. Bend the right knee and sit the right buttock down as though you are sitting on a chair. Reach over the right leg. Take the hand to the floor or to a brick. Reach the left arm over the ear. Keep the back knee straight. Lengthens and strengthens the legs, hips and spine and improves balance. Step the feet a leg length apart. Turn the right foot out90 degrees and the left foot in 10 degrees. Come into triangle pose on the right. Bend the front knee, place the right hand on the floor or on a block under the line of the shoulder. Raise the left leg up. Start the pose by looking at the floor. When you are confident in the balance you can turn to look up at the top hand. Looks simple! Strengthens the legs and lower back, lengthens the hamstrings. Sit on a folded blanket if your hamstrings are tight. Sit towards the front of the sit bones. Lift the front and back spine up strongly.